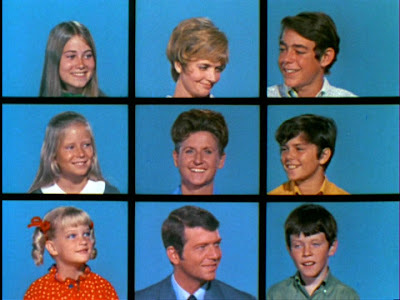 When describing The Brady Bunch I might use words like: comforting, enjoyable, beloved, and life-changing, but "funny" is just not one of them. 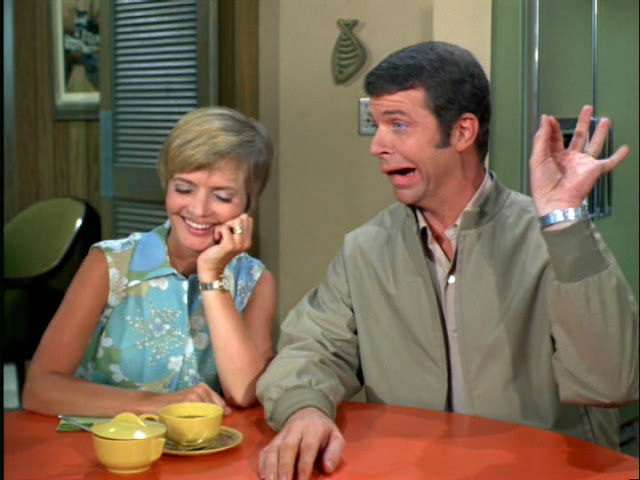 Believe it or not, it is well documented that the show was meant to be a Comedy, and in fact, certain sequences were written with intent to cause laughter. I've often pondered the nature of Brady humor. So much happens in the name of mirth, yet it yields so little. It's not just because it's outdated. 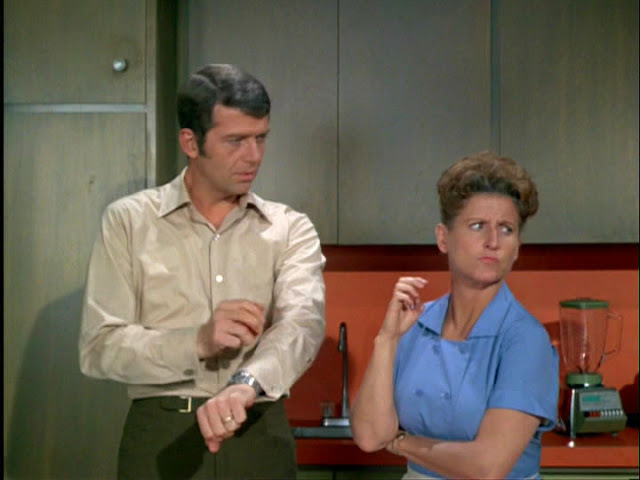 Plenty of shows older than The Brady Bunch can still get real laughs. While there is a juvenile element, I don't think it's to blame either. 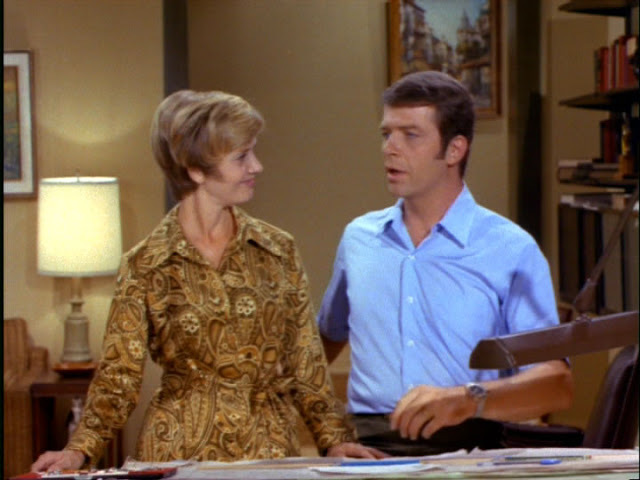 I think the Bradys aren't funny because they're too realistic. Their casual wisecracks resemble the real life humor that ordinary people attempt as they relate to one another everyday, especially if kids are around. I wouldn't roll my eyes if I had a coworker who joked around like Alice, but I wouldn't laugh aloud either. 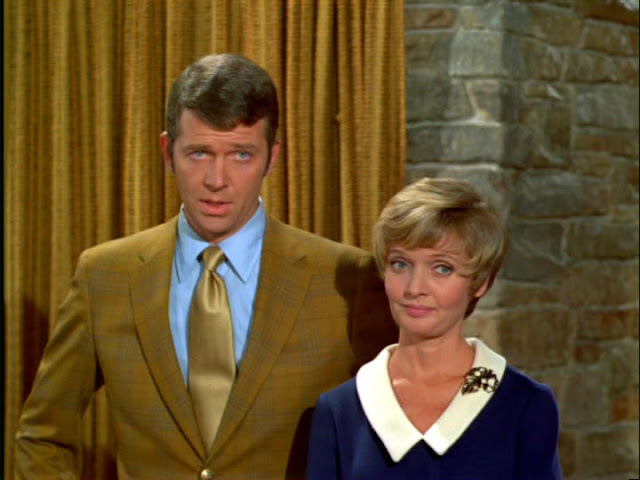 Neither do the Bradys. They usually retort with a quip and move on. Yet the canned laughter on the show seems to indicate that the gags are supposed to be laugh-out-loud funny. This divide between the artificial audience and the response from real humans can create a dissonance that is off-putting for many viewers. What exactly were the writers trying to pass off as jokes? 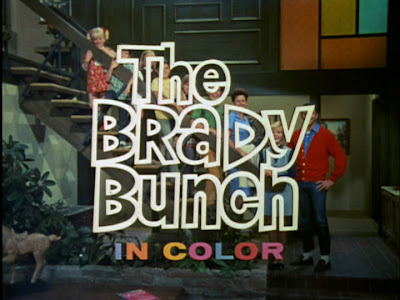 To clarify on the "laugh track intensity," close inspection reveals that the prerecorded laughter on the Bradys can vary from joke to joke. 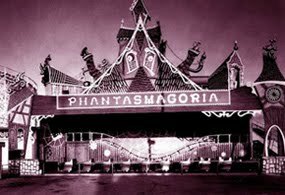 The audio engineer adjusted the intensity and duration of each phony burst of laughter according to the perceived funniness of each gag. So some "bigger" jokes get riotous laughter while other gags nearly bomb with the faux crowd. I have developed a laugh-o-meter in which the number of stars is proportionate to the length and robustness of the "laughter." * = A chuckle from one or two members of the audience. ** = A brief expression of amusement from a modest portion of the crowd. *** = A hearty laugh had by all. The general consensus is that this is funny stuff. ****= The highest level of uncontrollable laughter, reserved for only the most outrageously comedic moments in a given episode. (-) = The rare instance when a joke was likely intended by the writer, however the execution failed to the extent that no fake laughs were issued. 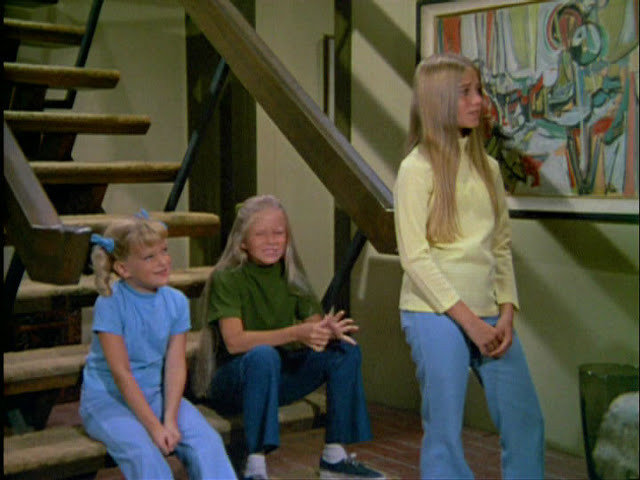 The Brady girls impatiently wait outside Mike's den as mister and missus Brady discuss something seemingly important. It's part of growing up for a girl. Jan and Cindy in on this too? Well it wouldn't be fair to leave them out. Let's go ahead with it. 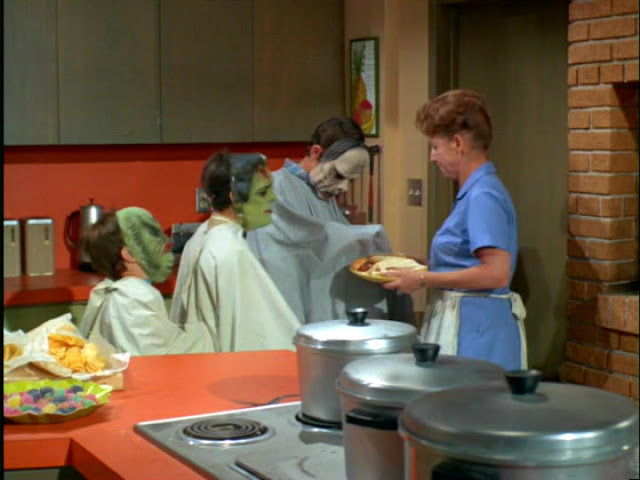 Later in the Kitchen, Mike walks in and finds Alice behind the counter expressing visible concern. Hey Alice did ya hear? Said we're gonna have a slumber party. Alice.. Just a few little girls.. it can't be that bad. 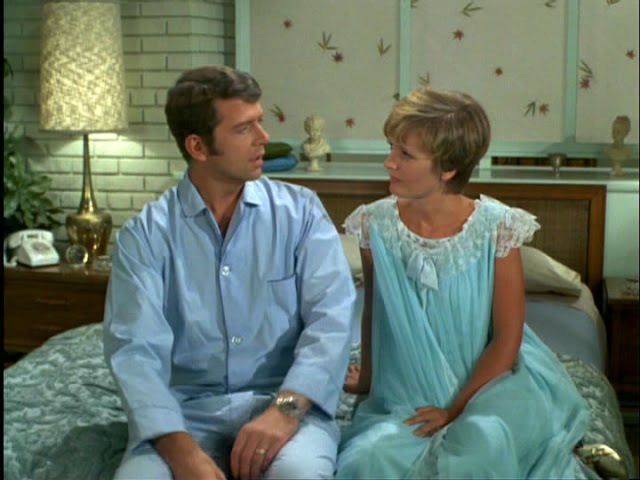 Mr. Brady have you ever been to a slumber party? No. Can't say that I have. We're gonna be invaded by girls. Will there be a lot of 'em? They won't do anything but giggle all night long. You know I'll bet ya Marsha invites that Paula Tarry. That's a disgusting thought. I'll probably have to hide all night. Hey fellas. C'mon I can use a little help. I wanna get the sleeping bags out of the storage room in the garage and air 'em out. No, sorry fellas. No such luck. Well, for the slumber party. We can't put all the girls up there in the girls room, they'd be packed in like sardines. Are they gonna sleep out in the back yard? 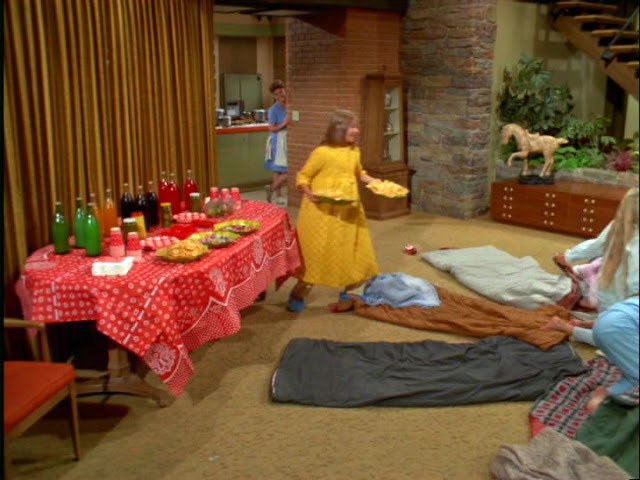 No they're gonna sleep in the living room in the sleeping bags. They'll get 'em all full of perfume. Eh, That'll be enough of that, now c'mon, help me. No, hot dogs are easier. And lots of pickles too. And one bag jelly beans. Listen you kids better get your books. You're gonna be late for school. Mom, remember what you and dad promised. Mike walks in hearing the tail end of the conversation. Oh, well it was kind of what I promised for both of us. That eh, we'd leave the girls alone. We wouldn't hang around the party. Oh, no I have a much better idea for us. Would you like a little hint? That sounds good. That is unless Alice doesn't mind holding down the fort while we're gone. 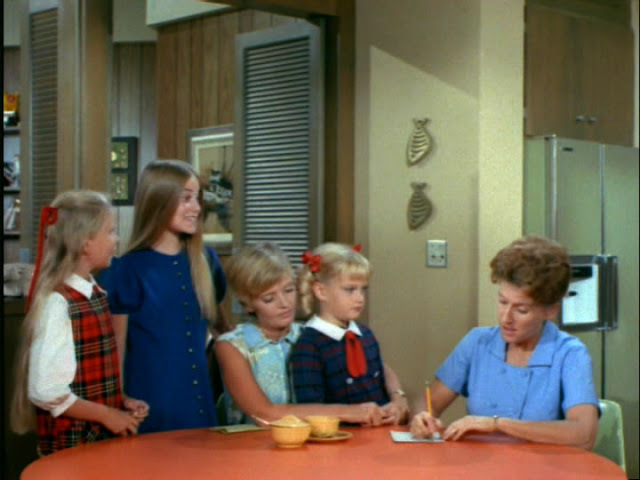 Later in the girls room, Marsha makes out a list of invited guests. Now let's see. I've already invited Jenny Wilton, my best friend... and Paula Tarry from my English class... now, who else? What do you do at a slumber party? Hey, I got it. Oh, boy have I got an idea. Are we gonna have fun at that slumber party. Listen to me you guys, now listen.. we're gonna pull tricks on 'em.. get it? 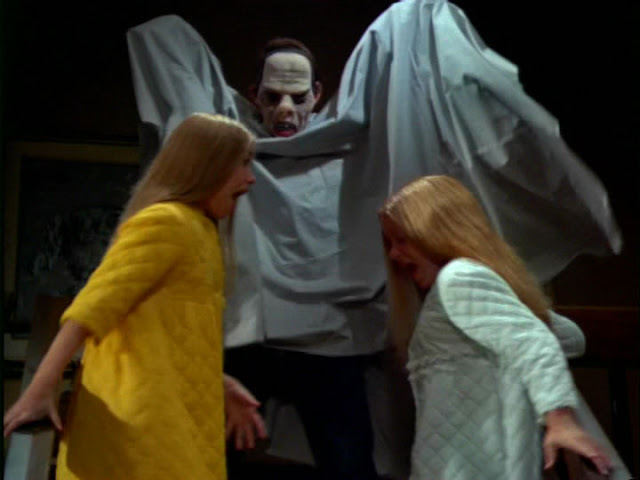 Yeah, you know, scare 'em. Jokes. Now we oughta be able to think of some really great stuff. Yeah, yeah that's good! Hey wait a minute.. wait a minute. I got it. Oh boy, is this beautiful! Later in the back yard Mike and Carol inspect a row of sleeping bags on the ground. Well I know the boys aired these out Mike, but they still seem a little dusty to me. Yeah well, I got 'em to do them this morning. I guess they didn't have too much enthusiasm for the job. Well maybe we oughta hang them up and beat them. Oh, Mike. Well, look I think I'd better go check the food for the party. Hey, is all that just for the girls? 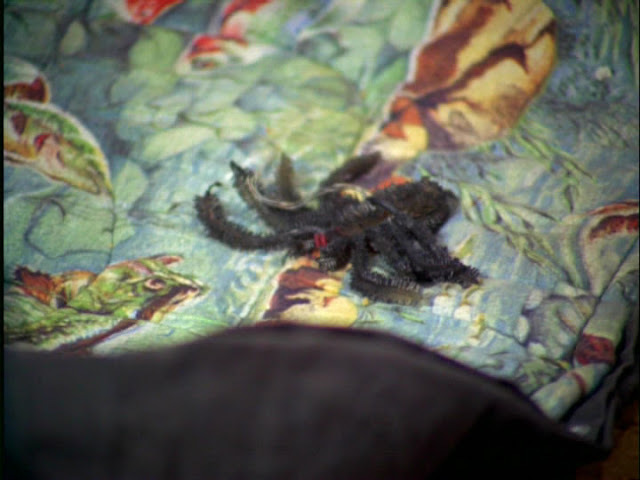 Say listen Gregory, your mother's not too happy with the job you guys did on the sleeping bags. Yeah I think they need just a little more freshening up. We'll do anything mom wants us to do. No trouble. I'll go get the guys. I thought you said they weren't too enthusiastic. The next day at school Marsha is in the principals office. Mrs. Denton found this when she was tidying up the desks in her room. Please take a look at it. 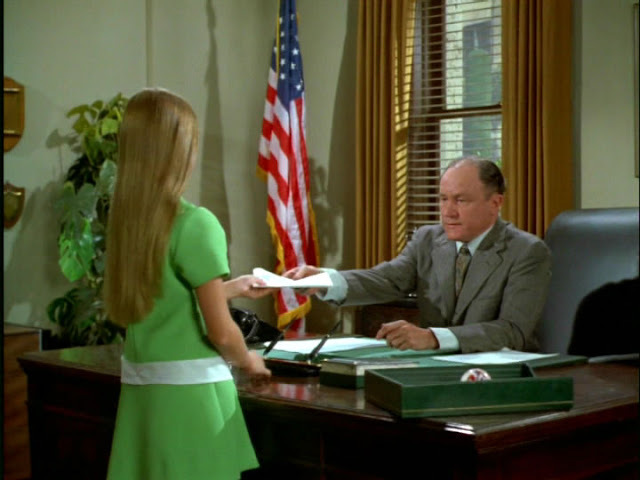 Randolph hands Marsha a sheet of notebook paper. "Mrs. Denton or a Hippopotamus?" Is that your handwriting and your class? Yes sir, but that's not Mrs. Denton. It's George Washington. There's a picture of him on the wall and I was copying it. 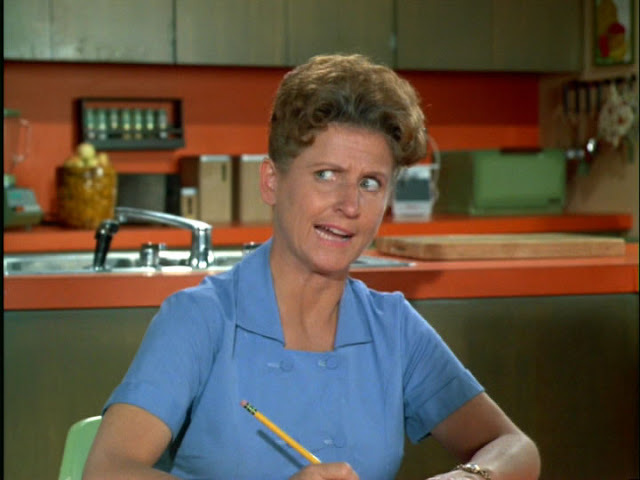 And what about Mrs. Denton's name and that remark? I didn't write her name, or that remark. Marsha I think you'd better explain. But I can't! I mean... Well, I finished my classwork a little early and I was doodling and my name happened to be on the paper. Doesn't much look like George Washington. I guess I'm not a very good artist. You expect me to believe this is your paper, your name, and your drawing, but you didn't write her name or that remark. Marsha I'd like to believe you. You've always been a good student, but what you're saying doesn't sound logical. This sort of thing has happened before, too often. Not just you but the other students. I'm afraid you're going to have to be the example. You'll have to stay after school one hour everyday for a week. That's all Marsha. Except because you'll be staying after school I'll have to notify your parents. 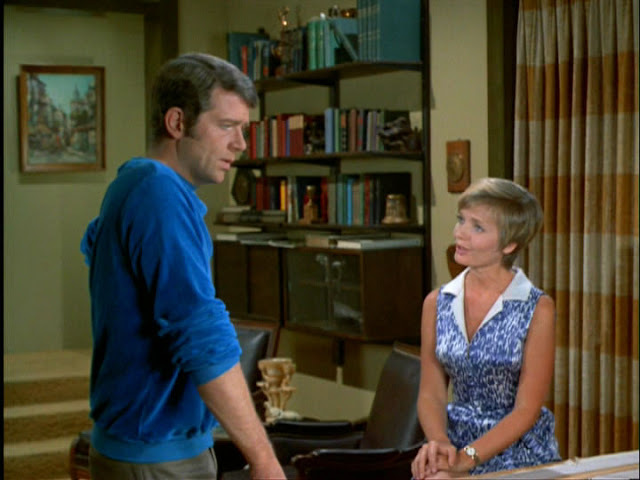 After school back at the Brady den, Mike and Carol talk to Marsha. 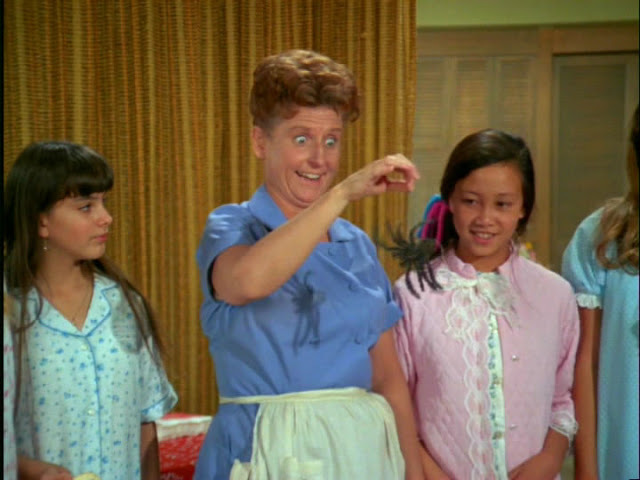 As much as we hate to do it Marsha, I'm afraid you can't have your slumber party. Honey, that drawing might have seemed funny at the time, but you just must have respect for your teachers. But I didn't do it! I didn't write Mrs. Denton's name on it or that stupid remark. Your principal said you did honey and he's a very responsible man. He wouldn't punish you for nothing. You mean you'd rather believe him than me. 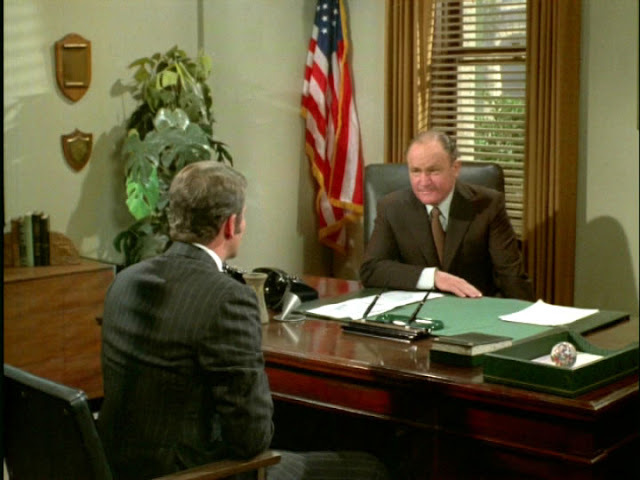 Marsha, from what you've said that paper was in your desk and your name was on it. Now what else could Mr. Randolph think? You don't believe me either. And if you don't I don't want a party or anything ever from you! It's not like her honey. I've never seen Marsha so adamant. That's one thing about Marsha when she's wrong she admits it. And the slumber party isn't the big problem. It's the fact that we don't believe her. Mike do you think Mr. Randolph could be mistaken? Well there's one way to find out. 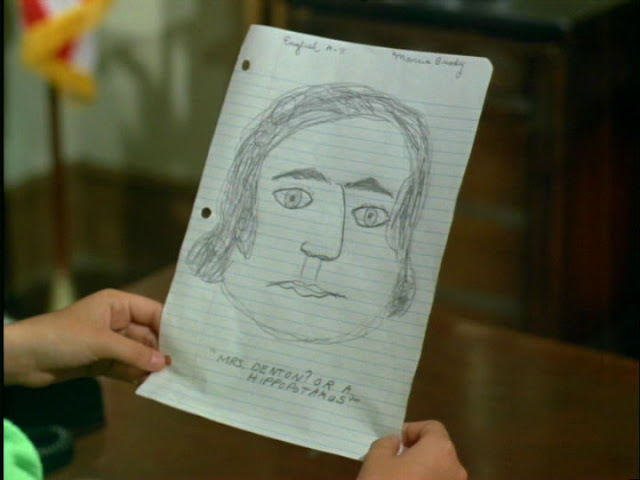 The next day Mike sits in Mr. Randolph's office holding the drawing. 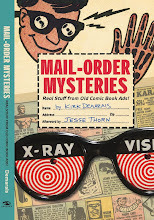 Well, I can't vouch for the drawing or what's printed underneath, but there's no doubt about the class and the name. That's Marsha's handwriting alright. 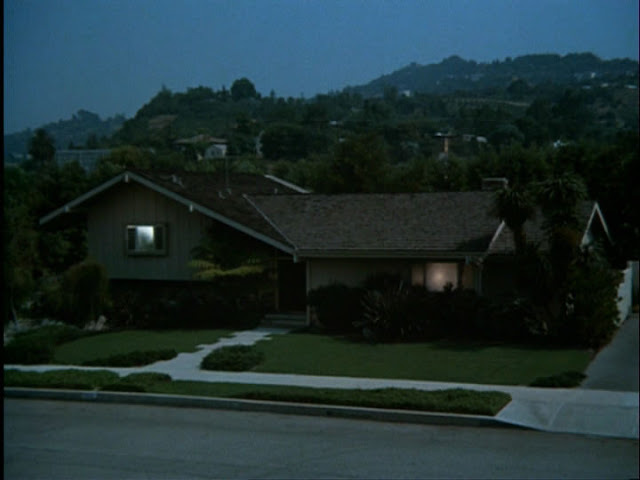 There was only one conclusion I could reach Mr. Brady. 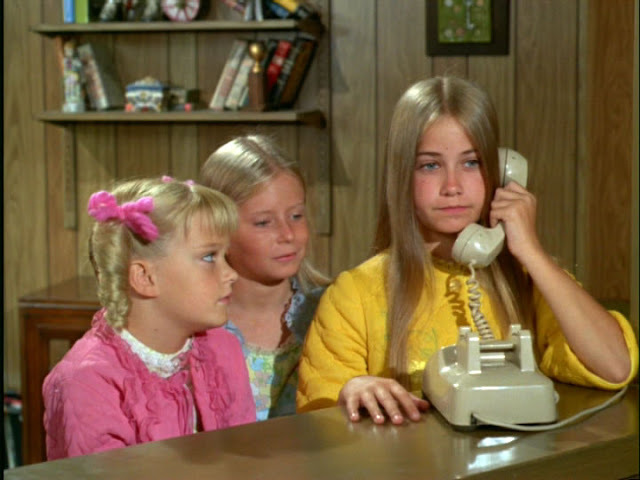 Oh, yes of course, it's uh, just that Marsha was so upset I felt I had to speak to ya. I understand. 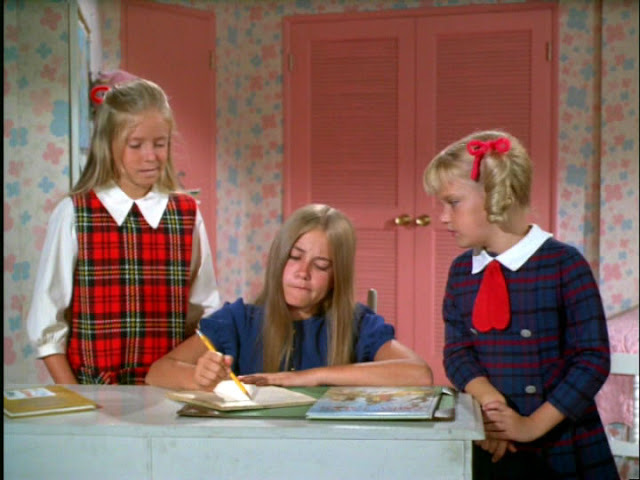 Marsha's always been an excellent student but uh, well, we do have to preserve discipline. Oh, yes. My wife and I certainly agree with you on that. Well, thanks for you time Mr. Randolph. Not at all. I only wish more parents would take the time to get involved. By the way, would you mind if I kept that. It could be George Washington. Well of course it could. 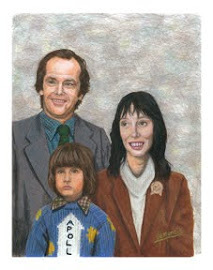 You know she admits she drew the picture but anybody could have done the printing. 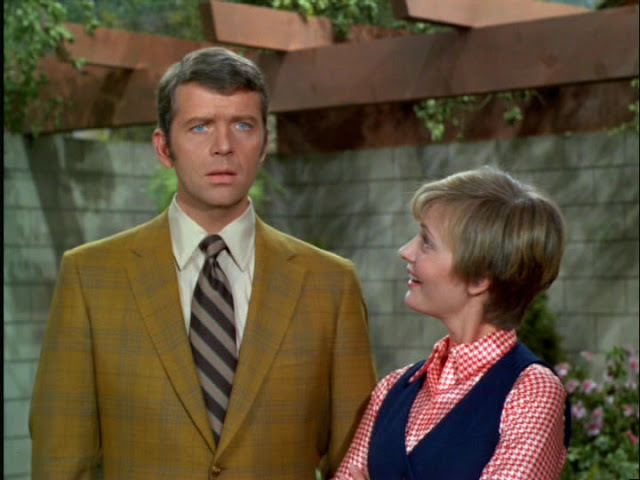 Honey I think an understandable mistake has been made and we ought to take Marsha's word for it. Well I think we should too. Of course this is just our judgment. There's no way to prove it to Mr. Randolph. I know. 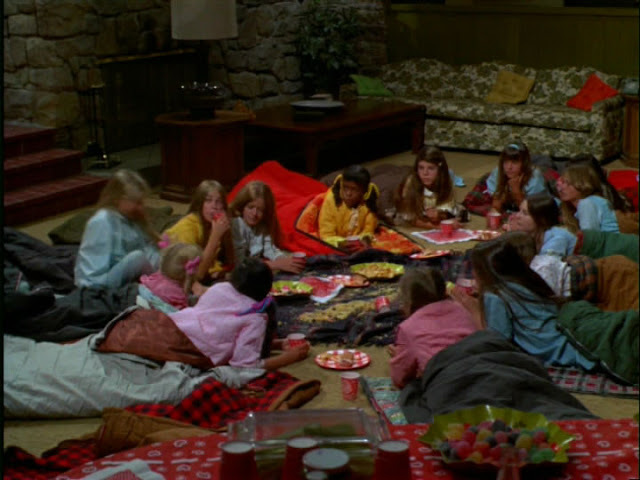 What about the slumber party? As far as I'm concerned the punishment at home is off! Let's have the party. 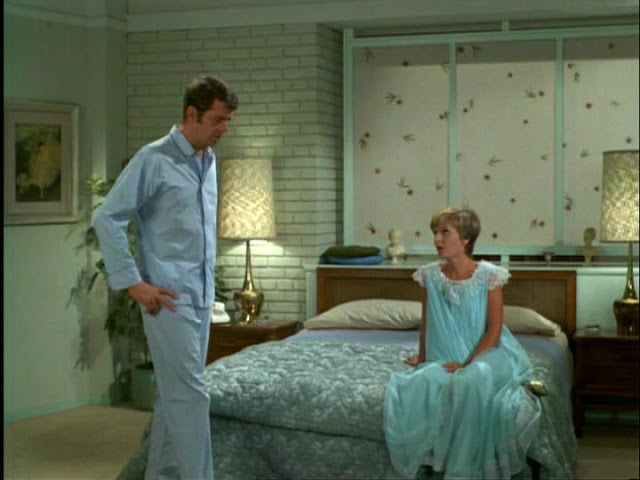 Soon thereafter, Carol enters the girl's bedroom. Marsha. Your father and I just had a little talk. 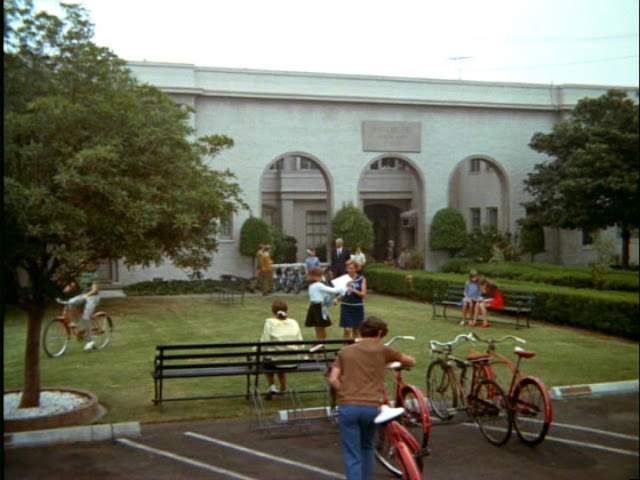 Now we don't know exactly what happened at school, but we think there's been a mistake. We believe what you said about the picture. 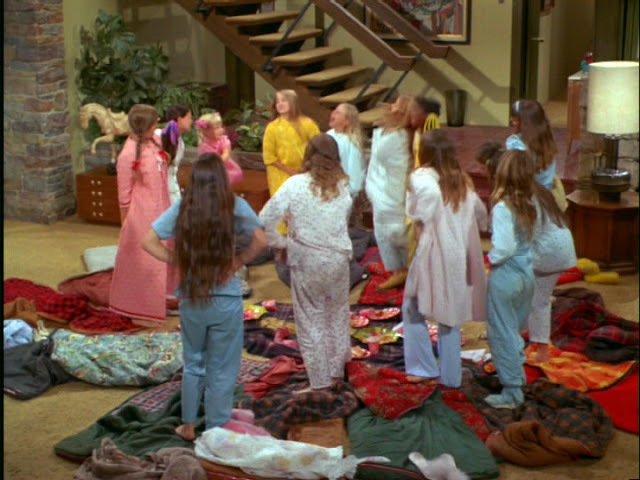 Well you'll still have to go along with your punishment at school but the slumber party is on again! 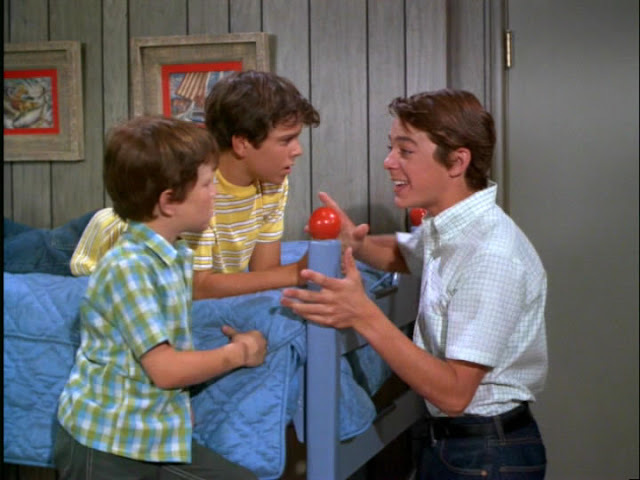 The boys sit in their room and hear the commotion from the girl's room. 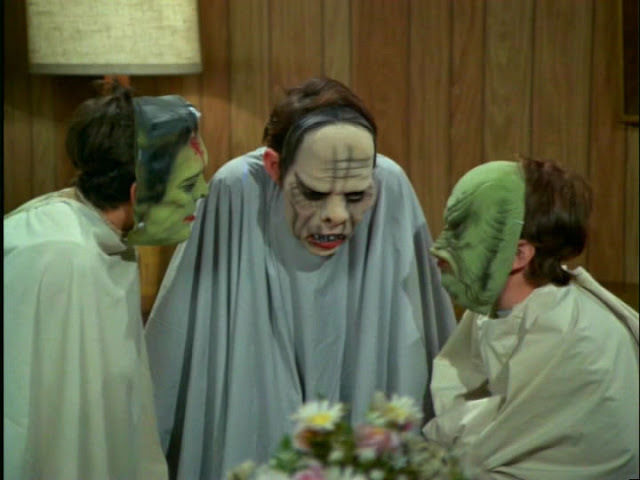 Hey fellas I just thought you'd like to know the slumber party's on again. Well, I hardly expected that reaction. Well, we're kind of looking forward to it. Oh yeah, well that's, that's very nice of you Greg. All you boys. We'll be glad to do anything to help the party along. The girls are back in their bedroom. But I still have to stay after school for something I didn't do. I've been thinking about that. I've got English the next to last period in the afternoon. So I figure whoever used my desk for the last period might be the one. Hey yeah, that's the only one it could be. But do you know who it is? Jenny Wilton? She's your best friend! Marsha talks on the phone as the girls look on. 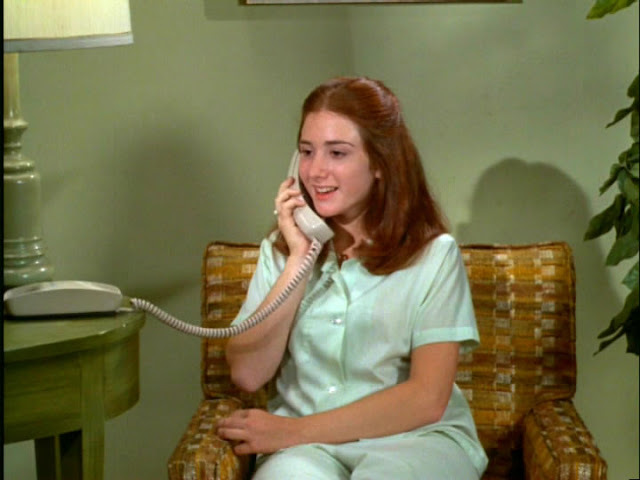 Hello Jenny, this is Marsha. I called about the slumber party I'm having tomorrow night. Well, it's only for my friends. Sure, I'm your friend Marsha. 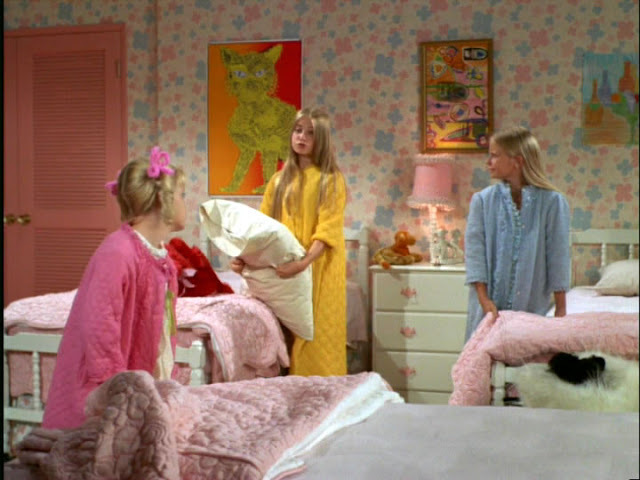 The night of the slumber party arrives. 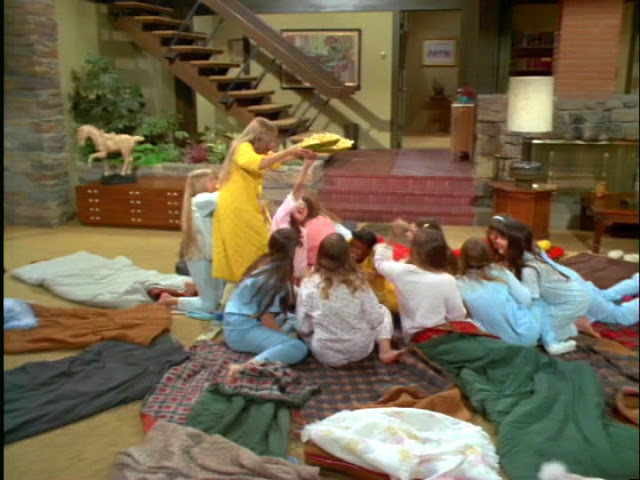 Alice watches the girls as they congregate around a circle of sleeping bags. A table of snack food awaits. Hey, where are the boys? 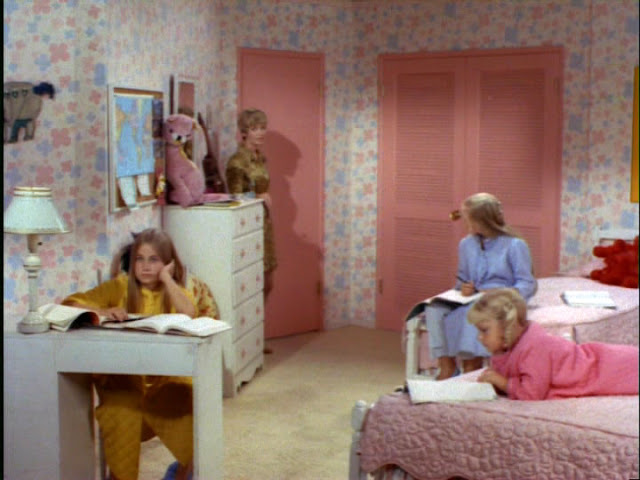 They're in their room studying. Oh, come on Mike. Good luck Alice. Hey guys, let's play "ha!" 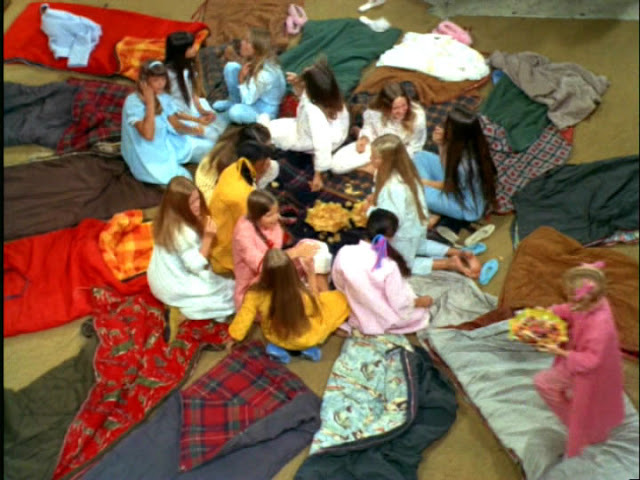 The girls lie on the floor in "Ha" formation. Each girl rests their head on another girls stomach creating a circle. Ha. Ha. Ha ha ha ha... etc. Okay, and I'll go first. Paula, you're the one. Who's the cutest boy you know? Truth or Dare? Now it's my turn to ask. 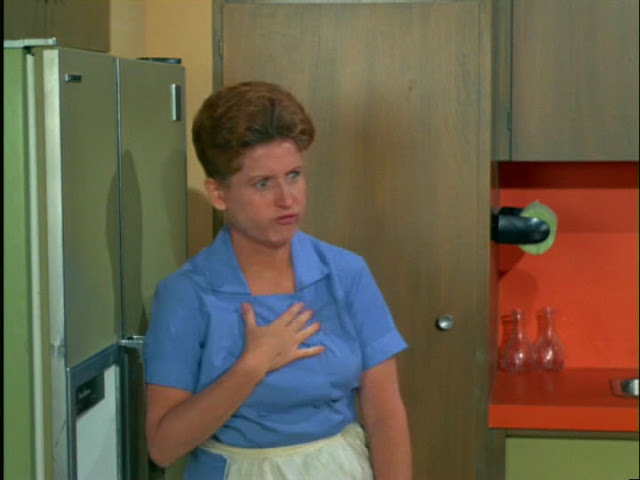 And Ruthie, you're the one. Truth or Dare. Have you ever been kissed by Hank Coleman? 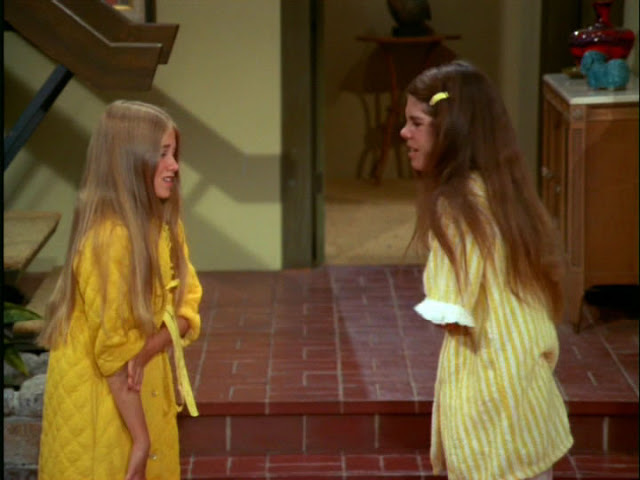 Alright, you have to go upstairs and see what Marsha's brothers are doing. Karen, will you come with me please? It looked like a monster! I think it was Greg. Hey I forgot the potato salad. Or found somebody's head. Eh, I'll be right in. Ok, this is it. The real action now. Last call for hot dogs. 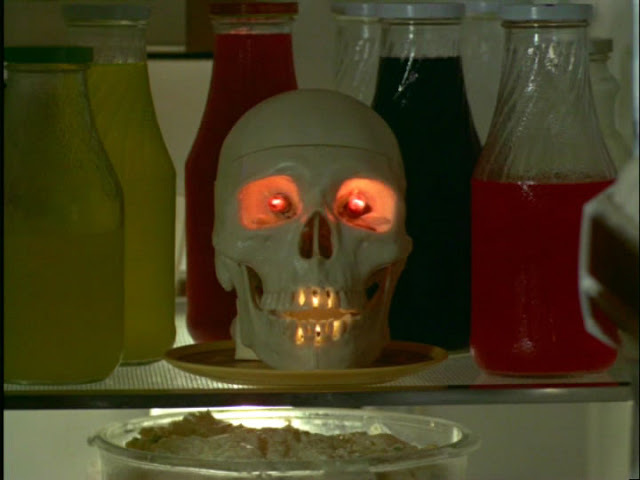 Hey, any of you monsters want a hot dog? I'll bet you it's my brothers again. No Alice. Itching powder in the sleeping bags. Oh, my. Okay, look we'll try and wash it off. Everybody upstairs. Come on up to the shower. C'mon kids. Boy are my brothers gonna regret this. It itches, but it's kind of funny. I like jokes. What about the one we pulled on Mrs. Denton? Yeah. You drew the picture and I wrote the funny line. You know, about the hippo? Yeah. Didn't you think it was funny? Funny? I got punished for that! Yeah! I have to stay after school a whole week now. I almost didn't have this party because of what you wrote. Gee Marsha, I'm sorry. I didn't mean for anybody to see that but you. Well, they did alright. Mrs. Denton found it and turned it in to the principal. I didn't know that. Would it help if I went to Mr. Randolph and explained? Mom, dad, I've done something just awful. I blamed Jenny Wilton for writing on my picture, the one that got me in trouble. I told her she wasn't my friend anymore. I uninvited her to my party. And Jenny didn't do it. Mm, mm. It was Paula. Only she didn't mean any harm. She just meant for me to see it. Well dear it seems to me that both you and Jenny got a taste of the same medicine. You were blamed for something because somebody didn't have all the facts. You turned around and did the same thing to Jenny. I feel awful. What can I do? Well look dear it's still early. Why don't you call Jenny and invite her over to the party? I sure will. I'll give her the biggest apology I know how. Later, the girls are back in the living room eating when the doorbell rings. Oh, that must be Jenny. Once Mike is off camera a loud clanking sound is heard. Everyone in the room laughs. Hey Alice, have we got any cookies? 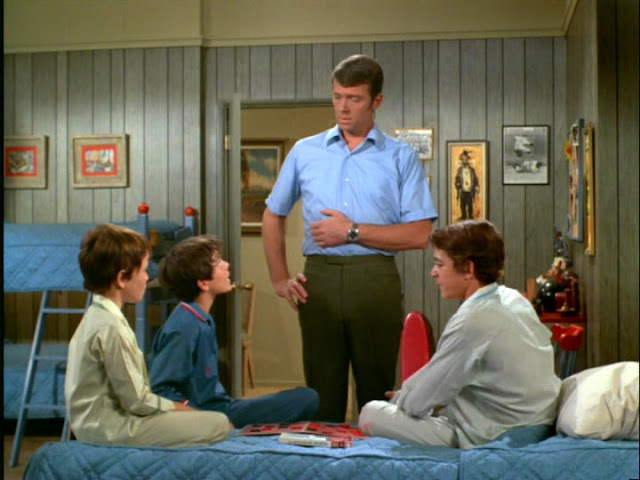 I don't know Mr. Brady they pretty well cleaned us out the other night. Hello? Oh, good morning Mr. Randolph. Well, I'm delighted. Really? Uh, thank you so much for calling. Bye. Marsha and Paula explained the whole thing to Mr. Randolph and Mrs. Denton. They're forgiven. Well you're in luck Mr. Brady, I found a box of cookies. Ooooh, get rid of it. End credit squares appear on the screen. This amounts to one joke about every 20 seconds, or nearly 3 per minute. 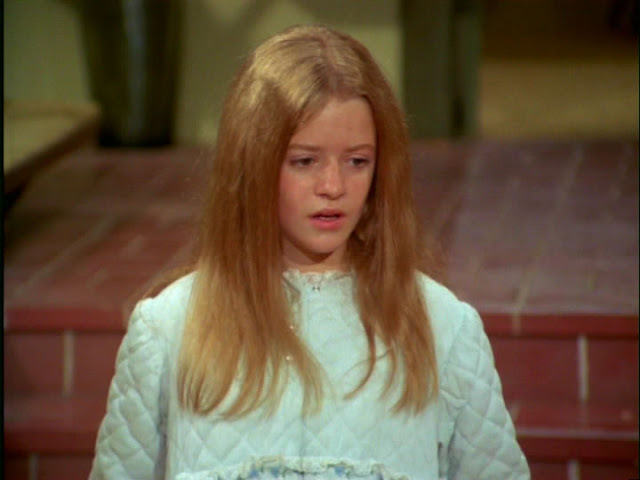 I agree that the Brady Bunch was mildly amusing at best but your commentary on this episode made it very funny. Thanks for posting this. And here is exactly why the internet exists. 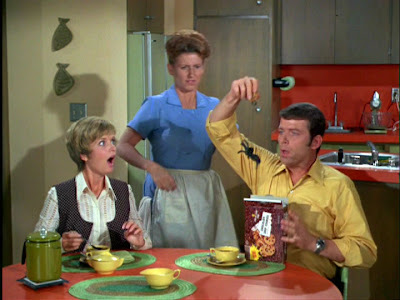 The Brady Bunch was, to me, excruciatingly unfunny. And as this is almost presented as a script, you can imagine the gag writers dealing with this on paper and not realizing how poorly it was going to translate. Or maybe they just didn't care. Also: Why the "B" plot? 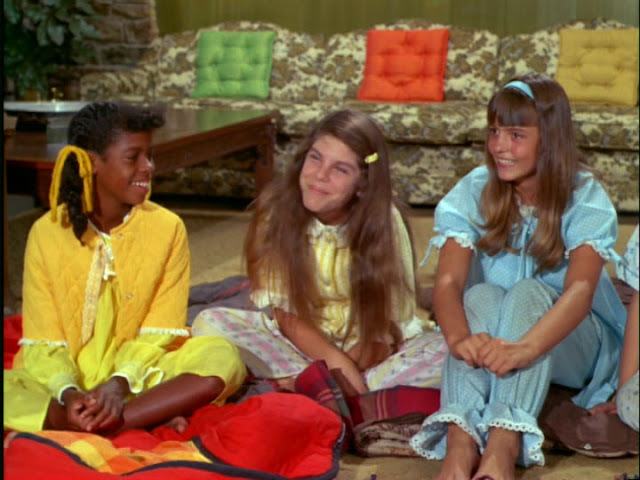 Look, it's an insufferably dumb 70s sitcom; stick with the slumber party gags, the moral lesson, which is less funny that the actual gags, is a drag on the pacing. It's as if the writer of this episode took a class or two and somebody demanded that every story has to have a resolving B-plot! Who has that many sleeping bags? Can you make a more fake outdoors set? Was the writer(s) failed historians who couldn't get a job? Why does the actor playing Mike have two modes: ham or stale toast? Why does itching power have a convenient time limit to start working? 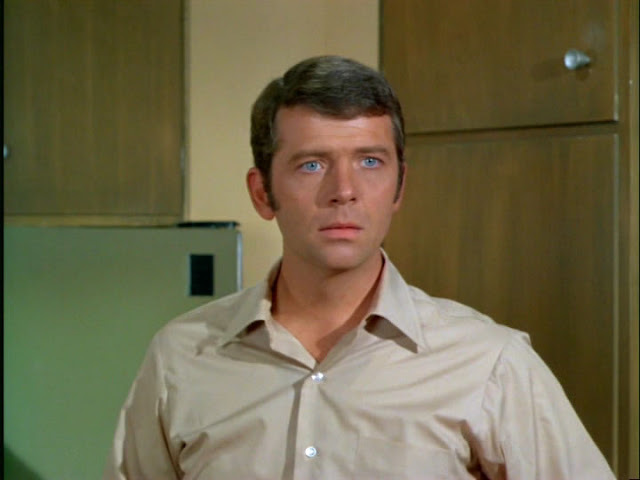 Brian- Yes, that "on paper" factor occurs to me often, in this and many other shows/movies. Suddenly I see the printed words in my minds eye. Great observations too. 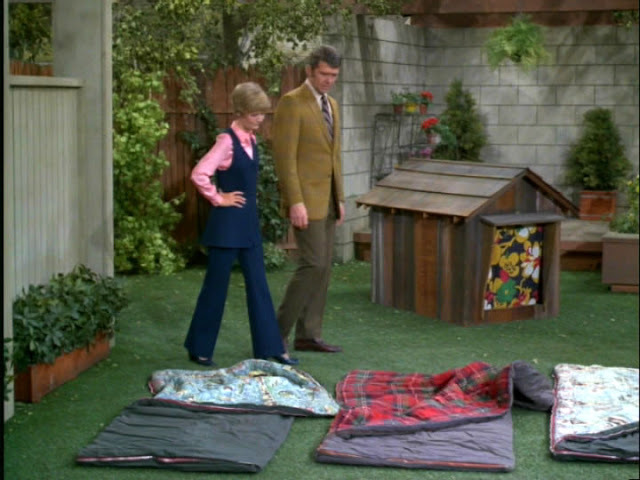 There are other episodes when they have to 'air out the sleeping bags.' Such a Brady ritual. 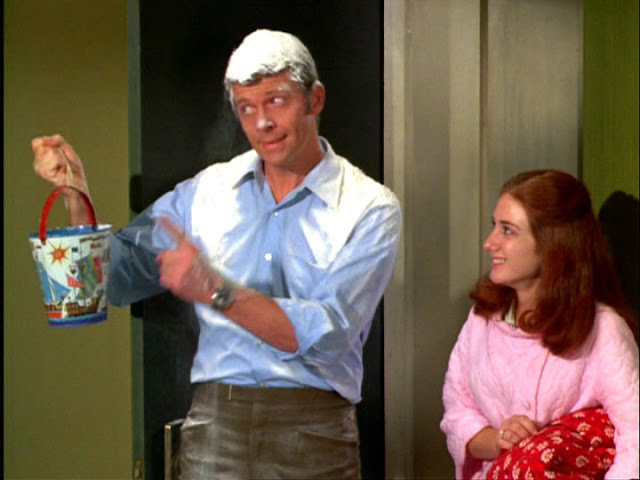 And your point about the delayed itching powder gets the 'plot hole of the episode' award. Todd- This is my very favorite episode, the reasons are probably obvious. It was fun to study it so closely. Wow, BMG while reading a Brady critique sounds wild. A truly Postmodern experience! Great post and analysis of one of my favorite episodes as well. 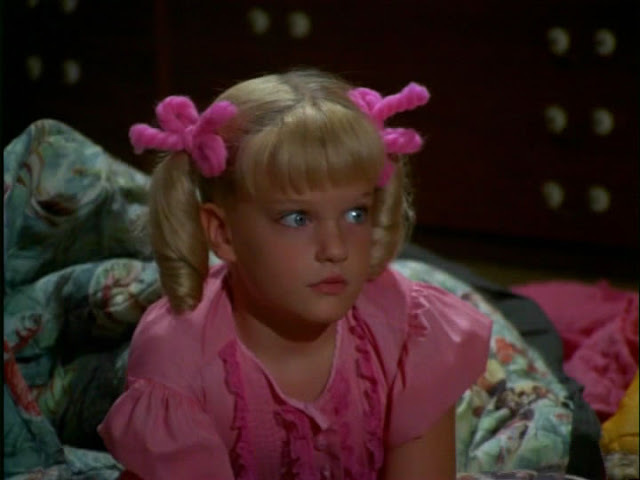 Ranks up with the episode where the boys and girls try to scare each other and end up scaring Alice who busts the bust of Mike. 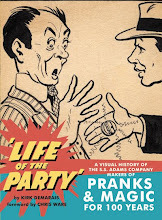 I've never paid attention, but I wonder if the use of the laugh track changed any in the later years. Tom- The scaring episode is at the top of my list too. The plastic ghost rising from the chest saying "I need air!" 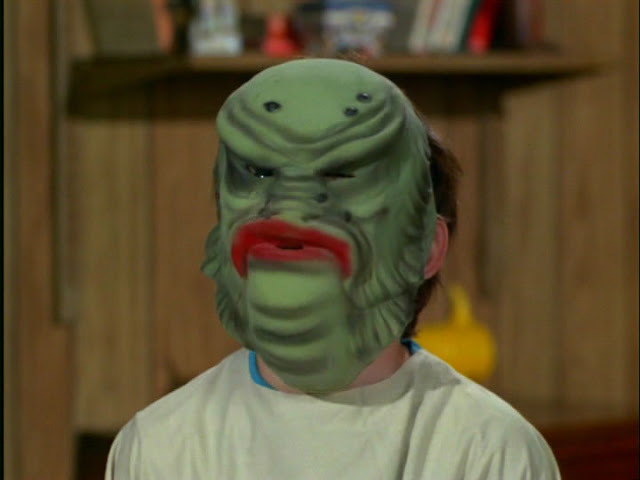 freaked me out when I was a kid. That's an interesting and dangerous question you ask. I don't know, but I may need to look into that now. 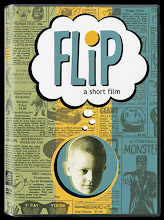 Haven't seen this one, but yes indeed; the writeup reads like a script... so, I guess I have seen it. Buuut, I was "watching it" to the tune of "Carnage Visors" by The Cure. 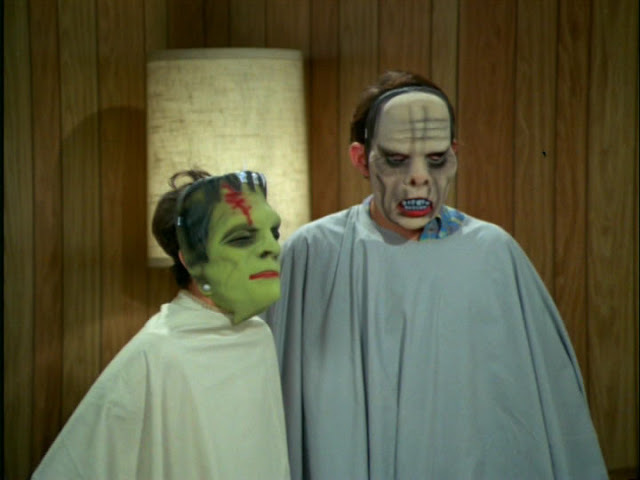 My mistake, as suddenly everything has become much creepier.